Wednesday 4/17 - ALL KICKBALL GAMES ARE BEING PLAYED AS SCHEDULED. Utica Kickball registration is now closed. We will be having a brief captains meeting on 04/20 at 1pm at the Vets Club field. If you can not attend you will need a team representative to attend for you. Any questions in the meantime please feel free to reach out. Schedules are now live. Team payments are due at the captains meeting this Saturday. Spring Softball Registration for The Spining Wheel is now closed. Team payments were due on Sunday the 14th. If team payment is not received you may not be added to the schedule. Schedules will be out approx one wee before the league starts. League play begins April 28th, 29th and 30th. Welcome To The Syracuse Sports Associations Softball Page! Registration for the 2019 season will open on January 20th! Syracuse Sports Association offers men's, women's & co-ed Softball leagues during the Spring, Summer, and Fall seasons. All games will be played at the Spinning Wheel Restaurant in North Syracuse. 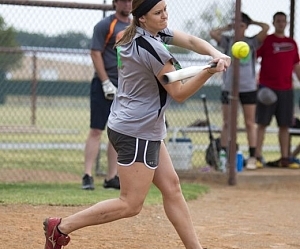 SSA softball are slow-pitch league's with a modified rule book with specific rules for gender ratios and batting orders. SSA provides various core / size game-balls for each game depending on your division. All games will have 2 umpires. Additional umpires may be added in certain situations. Teams should bring their own bats, gloves, and cleats, however any bat on the current ASA/USSSA banned bat list will not be allowed. The Spring / Summer Softball season are 14 games. Please allow for an extra 2-3 weeks for playoffs & rainouts. The Fall season is 6-7 games and an extra 1-2 weeks for playoffs & rainouts. Registration for fall softball will open on July 1, 2018. All teams in all leagues qualify for the playoffs. Whatever isn't covered by the following rules will default to the USA or USSSA rule book. All Umpires have final say on the field. Please respect their calls. **Please note: A player is not permitted to play on more than one team in the same league on the same night with any SSA softball leagues. Coed leagues must have 4 females. If starting with 3 an out must be taken in the line up spot where the 4th female should be. This must be declared to the umpire at the start of the game. 1) All SSA games will start with a one & one count. After the second strike you get one foul. 2)All games will be 7 innings. In case of inclement weather, darkness, light failure or any other unforeseen circumstances, 4- 4.5 innings will constitute a completed game. In playoff games all 7 innings must be finished in order for the game to be complete (unless the 12 run mercy rule is invoked). During regular season no new innings will start after 70 minutes. 3) A run rule of 12 runs after 5 innings is applied to all league play. 4) There is a two up HR rule applied to all league games. 5) For all leagues the arch of the pitch will be 6' to 12' from the ground. 7) You must follow the USA or USSSA approved bat list’s. See that attached forms if you are unsure of the approved and non approved lists or visit the USA /USSSA websites. 8) Teams can use an EP (extra player) which means a team can bat 11 in the line up and any 10, so long as 4 females are in the field at all times, can play in field. In order to utilize the EP you must start the game with the EP. An EP can not be added after start of game. There is no gender restriction for the EP so long as there are 4 females in the top 10 of the lineup for COED. 9) If a player on the roster shows up late they can be added to the line up immediately but only If starting with nine players. Otherwise after game play has begun players can not be added to the line up. 12) Umpire fee's are $25 per game and are paid directly to the umpire prior to the start of the game. 13) For all COED leagues we will be instilling a 180' outfield line. All players must start behind this line until the ball is hit regaurdless of gender. 14) All leagues will be Mat Ball. 15) No outside alcohol is allowed at The Spinning Wheel. All food and alcohol must be purchased at the bar. 16) Lastly, games must start on time. Teams are alloted a 10 min grace period BUT the game clock does start at your originally scheduled time. No Exceptions. Tip: Scoll down to register online and for complete details on all leagues. Format: Matball, Men hit regular handed. Play with 10 in the field. Minimum Of 4 Females at all times. Format: Men's Matball, 10 in the field. Format: Mat Ball, Men hit regular handed. Play with 10 in the field. Minimum Of 4 Females at all times.